There has been a serious demand for intermittent movement of packages in the industries right from the start. Though the continuous movement is more or less important in the same field of the sporadic motion has become essential. 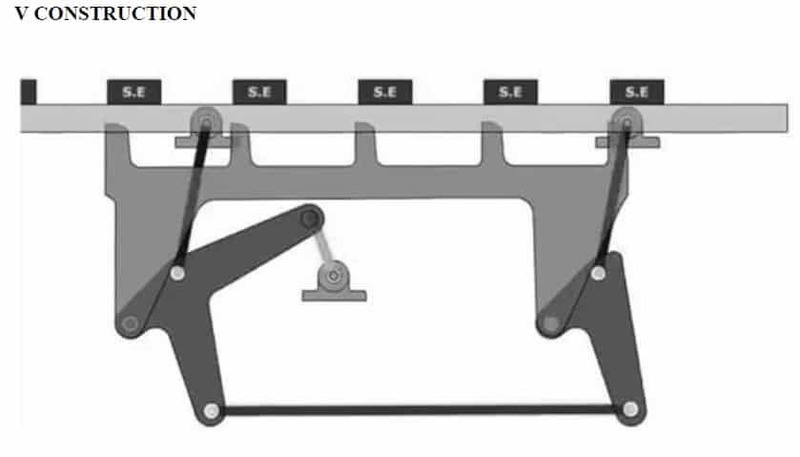 The objective of this study is to design a mechanism that delivers this stop and move motion using the mechanical linkages. The advantage of this system over the conveyor system is that the system has a time delay between moving packages and this delay can be used to introduce any alterations in the package or move the package for any other purpose and likewise. While in the normal conveyor mechanism such actions cannot be performed unless programmed module is used to produce intermittent stopping of the belt which is basically costly. The prototype design requires an electric motor, shafts and the frame of which, the frame and platform on which the packages are moved is fabricated. All the links are made up of normal MS (mild steel) and wood including the head which has a direct contact with the boxes that are to be moved. The system is expected to move as heavy packages as 2 KGs approximately. The aim of the project work is to design and fabricate a box moving mechanism that makes much easier to move with the so called quad staying machines by means of which a box blank is folded or set-up into box like form. These set-up boxes are transferred by means of a conveyor to an operator, who picks up the boxes and places and centers’ them on wrappers with which the boxes are to be covered. The boxes and wrappers are then conveyed to a box wrapping machine where the wrapper is folded around and glued to the box. Usually, the operation of the wrapping machine is controlled by means of a switch actuated by the box forming machine so that their operating speeds are related to each other. The box moving or shifting set up has a simple mechanism, operated with crank and links arrangement. As by the electric motor rotary motion is converted into the To and Fro motion of the linkages, it takes very simple. The rotary motion is converted in to linear motion by the crank and mechanical linkages arrangement. The conveyor system is either continuous movement or if the time delay is to be produced there will be definite requirement of software programming which will be costly. So a basic module of moving packages is designed with time delay which can be used to do alterations if required in the package or move the package for any other purpose. This invention relates to improvements in transfer and conveying devices, and it relates particularly to devices for transferring set-up cardboard boxes from a box folding or forming machine to the operator of a semi-automatic box wrapping machine. A great many manufacturers of fancy wrapped or covered cardboard boxes used for packaging candies, cakes and other confections, cosmetics and other articles are equipped computer-aided technologies [CAD, CAM]), to control industrial machinery and processes, reducing the need for human intervention. In the scope of industrialization, automation is a step beyond mechanization. Whereas mechanization provided human operators with machinery to assist them with the muscular requirements of work, automation greatly reduces the need for human sensory and mental requirements as well. Processes and systems can also be automated. Automation plays an increasingly important role in the world economy and in daily experience. Engineers strive to combine automated devices with mathematical and organizational tools to create complex systems for a rapidly expanding range of applications and human activities. The principle of box moving is to change circulatory motion or cycling motion of the DC motor into translator motion with the help of levers and linkages through metal connecting rods. Can use this mechanism in medical production fields. It also can be used in bottle filling process. Can use this mechanism in cool drinks production. Less skilled operator is sufficient. Noise of operation is reduced. predict accurately beforehand. Since this cost can have a large impact on profitability, it’s possible to finish automating a process only to Discover that there’s no economic advantage in doing so. Initial costs are relatively high. The automation of a new product required a huge initial investment in comparison with the unit cost of the product, although the cost of automation is spread in many product batches.